The lovely Marushka taking her ease. Looks like she loves the sunlight! Déjà le 204 ème cat blogging et toujours d'aussi belles photos. I always love your cat photos! Happy weekend! 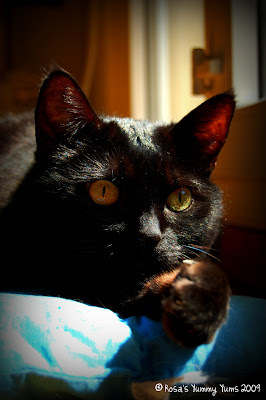 Aaaaaahhh.....what beautiful pictures of your lovely black cat!! Maruschka you are soo pretty. Lovely kitty! Rendez-vous du week end avec ton felin ! is one pillow sufficient for Marushka ? What a graceful and cunning leopard! Sucker for cat photos. May have to send sone along! Very mysterious, beautiful cat! I especially love the first photo with the light shining through the ears - so beautiful (and alert!). ..les images de ce superbe félin sont vraiment splendides..wow..
Gorgeous, Rosa! 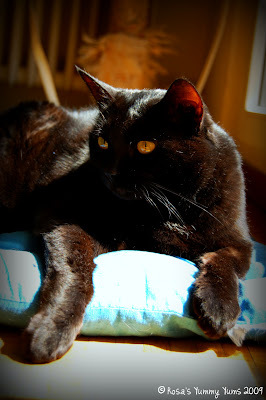 I have a black kitty at home too and they will always be my favorite!